Next time you visit New York City, why not plan a short break to experience some of the natural, cultural and culinary wonders of New York state? Carolyn Lockhart ventures beyond the glitter and grit of the Big Apple. On a crisp evening in early spring I am sitting in an elegant black limousine bus heading north straight from JFK International Airport. Like many Australians, I’ve been to New York City several times but never travelled beyond to Upstate New York. From the freeway we see new foliage misting the trees like wisps of pale green chiffon. Dogwoods drape to the ground smothered in white and pink blossom. On quieter roads fanciful iron gates open to grand country estates hidden from view. Pristine white two-storey clapboard “colonial” houses have huge American flags hanging proudly over their doorways. Tulips blooming in neat home gardens are also patriotic red, white and blue. Everything looks clean, bright and manicured. It’s a scene of semi-rural elegance still within commuting distance from the city. Later we will travel through The Catskill Mountains and the beautiful Finger Lakes region. Prosperous farmlands and vineyards lie between gracious university towns, picturesque villages and small cities such as Syracuse and Rochester. 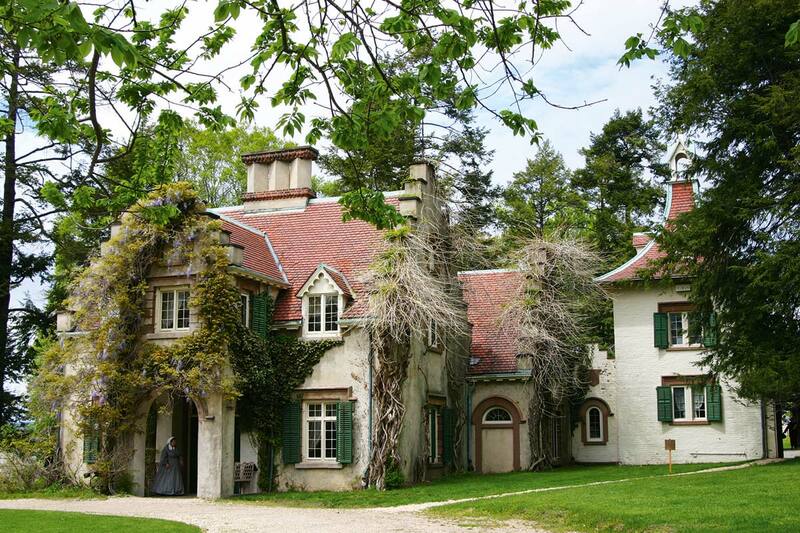 The Hudson River Valley is renowned for its fabulous mansions set in park-like grounds. Built in the 19th century by flamboyant industrial tycoons with names like Vanderbilt, Rockefeller and Jay Gould, many are open to the public. Lavishly furnished, with huge Tiffany windows casting a colourful gloom, they were used only as “seasonal houses” by the very rich to relax and entertain in the warmer months. Guests and their servants would arrive on the host’s private train. The relatively modest Sunnyside was the home of much-loved writer Washington Irving (‘The Headless Horseman’ and ‘Rip Van Winkle’). Everything is original from his writing materials and teacup to the rampant wisteria vine almost covering the exterior. 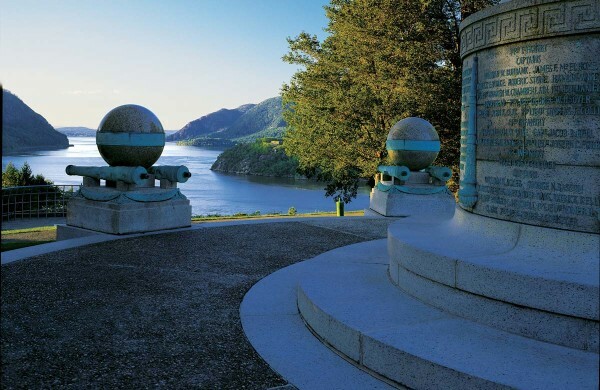 History buffs will love the Franklin D Roosevelt Museum and Library at Hyde Park containing much memorabilia from the Great Depression and World War II. Springwood is the house nearby where FDR lived with wife Eleanor. The IM Pei-designed Herbert F Johnson Museum of Art at Cornell University is a showcase for an extensive collection. The building incorporates a digital light show and has views over Cayuga Lake. In Rochester, art-lovers flock to the Memorial Art Gallery and sculpture garden. The selection of important works from famous international and American artists is breathtaking. Also in Rochester is the highly regarded Eastman School of Music. Nearby is the Eastman Museum and its extensive photography and film archives displayed in the home of George Eastman, the eccentric founder of Kodak. Another art is celebrated at the Corning Museum of Glass. Already the world’s largest glass art museum, it has recently added a new wing to display modern glass sculptures. Nelson A Rockefeller built the unassuming Union Church of Pocantico Hills to honour his mother. The nine stained-glass windows are by Marc Chagall and Henri Matisse designed the rose window (his last commission). The quirky design style of MacKenzie-Childs has added celebrity to the little town of Aurora. Passionate devotees of this over-the-top decorative style collect everything from pots and slippers to bed heads and entire bathrooms. National parks such as Clark Reservation State Park near Syracuse and Letchworth State Park in Livingston County are carefully nurtured. Trails, lookouts and stone retaining walls were built during the Great Depression to provide jobs. It’s paradise for hikers and cross-country skiers, but you can drive on roads that lead to lakes, picnic spots and spectacular waterfalls such as Ithaca and Taughannock (even higher than Niagara). The mighty Hudson itself, smaller rivers and ponds provide views and access to water activities of every kind. Don’t believe the old clichés about bad American food outside the big glamour cities. Good coffee is still difficult to find, but everywhere we went we discovered great pride in fresh regional produce and local specialties showcased in restaurants and trendy bars. Quaint little towns have interesting artisan bakeries and innovative chocolate makers. There’s been a recent explosion of craft breweries, cider-makers and boutique wineries. The Bocuse Restaurant on the campus of The Culinary Institute of America (CIA) is under the auspices of the great Frenchman himself. Trainees serve signature dishes such as black truffle soup with impeccable style. You must book well ahead. Visit Madava Farms, the home of Crown Maple Syrup, for a splendid breakfast of waffles, bacon, egg tarts and maple butter. Dinosaur Bar-B-Que has won awards for the best barbecue in America. It’s a crazy place, great fun and the delicious, inexpensive food is piled high. The upscale Shadows on the Hudson restaurant in Poughkeepsie has a wraparound view of the open river. Our lunch here (marvellous crab cakes) was a perfect last stop on our way back to New York City.